Cross trainers are multi-functional athletic shoes which are suitable for running, cardio, weight lifting and a number of other sports. They are universal sports shoes which provide both sufficient cushioning as well as solidity for the feet and legs. The question is – what if you have flat feet? Which shoes for cross training to choose so that there is less strain in the feet when running or training? It is important to pick cross trainers which provide support and stability, which is normally provided by the arches of the feet. So, look for cross trainers with stabilizing wedges which help prevent pronation. Also, pick trainers with lower heels if you plan to do some minimal jogging. If you are a serious runner, you should get running shoes. Last but not least, make sure the sneakers you choose have a midsole which provides support and lifts up the arches, and helps reduce the strain and the risk of injuries. These trainers are great for jogging, weight lifting, cardio or any other sport you practice. They are true cross trainers and are perfect for women with flat feet. So, grab a pair of these WX608V4 sneakers and your feet and legs will be thanking you pretty soon! This multi-purpose sneaker has all the features necessary to keep you safe and comfortable while jogging or training, even if you have low arched feet. – A comfy FluidRide midsole for arch bounce back, protection and cushioning. You will feel immediate comfort once you slip these shoes on. Make sure you order half a size larger though to get the best fit. Enjoy pain-free and safe weight lifting, Zumba or any kind of exercise with these wonderful cross-trainers. – A low profile Phylite durable midsole. – A minimal molded sockliner which provides enhanced arch and foot support. – They are not suitable for running outdoors or for outdoor activities, because they will wear quickly. Although technically it is a running shoe, the M1260v6 is a perfect cross training shoe too, and especially for people who have low arches and tend to over pronate. So, with its comfort, stability and cushioning, this is a great cross-trainer. The Gel Craze shoe is designed and made as a multi-purpose shoe with great cushioning and durability. It is one of our top picks for the best cross trainers for men with flat feet. In other words, this shoe is perfect for men who practice weight lifting, cardio or other exercising and need more arch support. The latest Nanos, which are named one of the top rated crossfit shoes by our editors are an even better version of this famous sports shoe line. It is also suitable for men with low arch support, as it has a removable insole which helps lift and support the arches while training. We are very happy with the latest version of this great cross-training shoe, which is a huge improvement from the Nano 7 shoe. 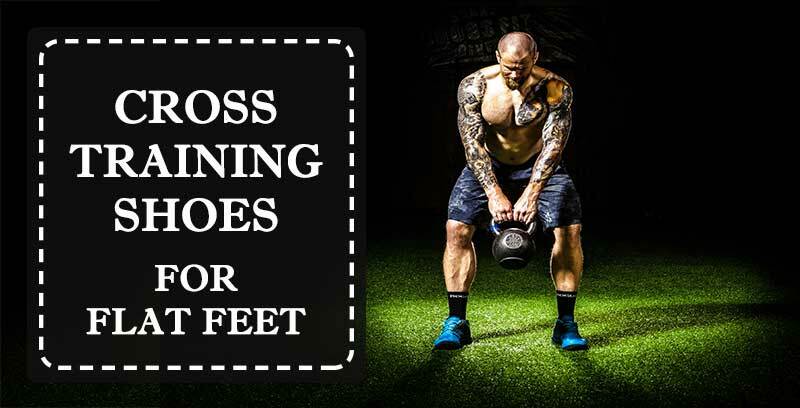 Cross trainers are actually very suitable for people with flat feet in general, because they are designed and made to provide sufficient support and stability during weightlifting or other exercises. The support to the arch improves the shock absorption, and thus reduces the risk of injuries to the knees, back or ankles. The cross trainers are also made to keep the feet aligned and from pronating, which is also great for people with flat feet. Look for the shoes with sufficient midsole support, but always try them before buying in order to feel whether the support and stability is sufficient for you. The cushioning should be sufficient, and the outsole durable and providing good traction. Also, it is preferable that they are lightweight and breathable.